Comfort food alert! 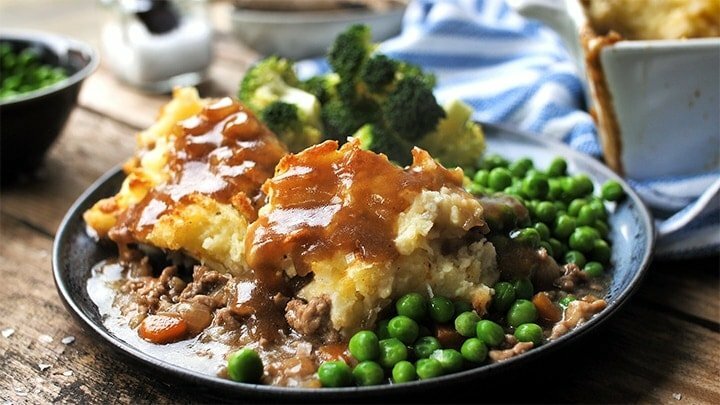 Shepherd’s pie with creamy mashed potato and rich gravy = just like your mum used to make! Did you know it’s British Pie week in 5 weeks? I feel like that’s a thing I should prepare for. I’ll certainly be posting a new pie recipe on Kitchen Sanctuary then, but in the meantime, I wanted to update this old favourite with a recipe video and a few step-by-step shots. 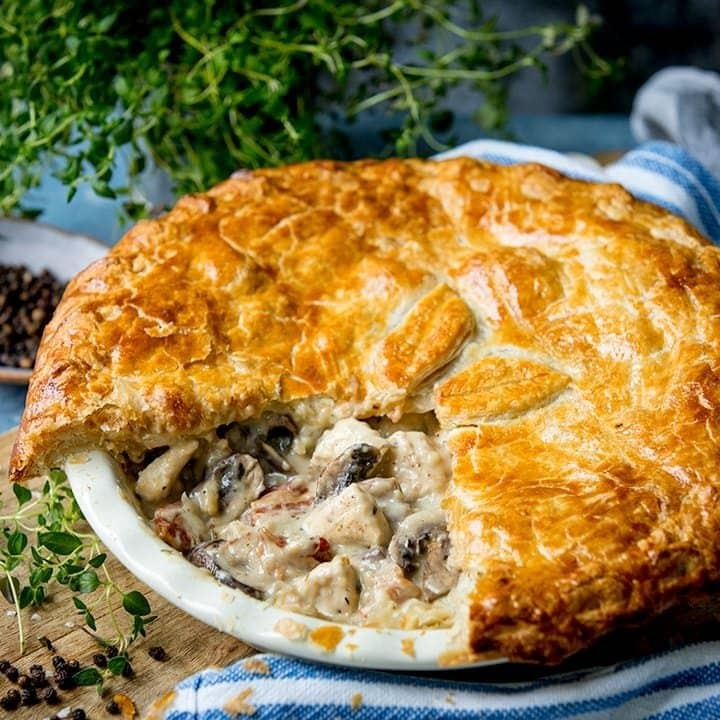 If you are not a big fan of mashed potato topped ‘pies’ then why not try one of my other pastry-based pies like my creamy chicken puff pie or my rich and tasty steak pie. Personally I LOVE a mashed-potato-topped pie. Does anyone else purposely leave a heap of mashed potato in the pan after dishing the rest up, then hover over the bowl, ‘testing’ it by eating it straight off the oversized wooden spoon you mixed the mash with? Ahh I love the chef’s treats. So we start by boiling up some potatoes for the mash. Whilst that’s cooking, we fry up onion, carrot and celery in a little oil until softened. Add the minced lamb and brown, then add in Worcestershire sauce and stock (**Pro Tip** I add in a lot more stock then you think you might need – this is so you have enough liquid for gravy later) and let it simmer. Stir in a little cornstarch slurry to thicken. 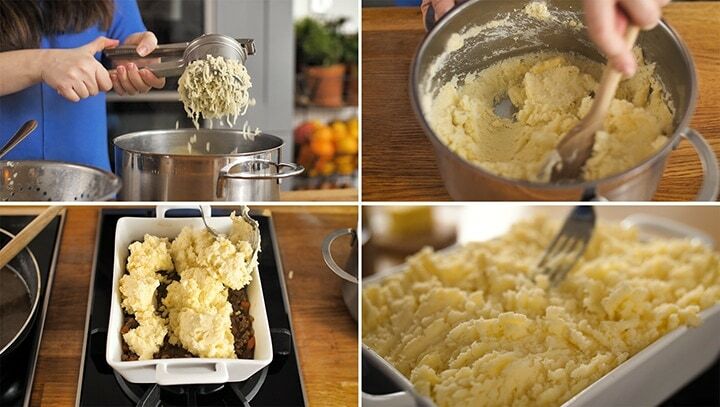 When the potatoes are tender, mash with a potato ricer (<–affiliate link) for extra smooth mash, and stir in plenty of cream, butter, salt and pepper (diet food this is not). Scoop the meat out of the pan using a slotted spoon, letting the excess drip back into the pan (this excess will be your gravy later) and transfer the meaty mixture to a baking dish. Top with scoops of mashed potato and then ruffle up the topping with a fork. The more more ruffles = the more crispy bits. Place in a hot oven for about 20 minutes until golden. 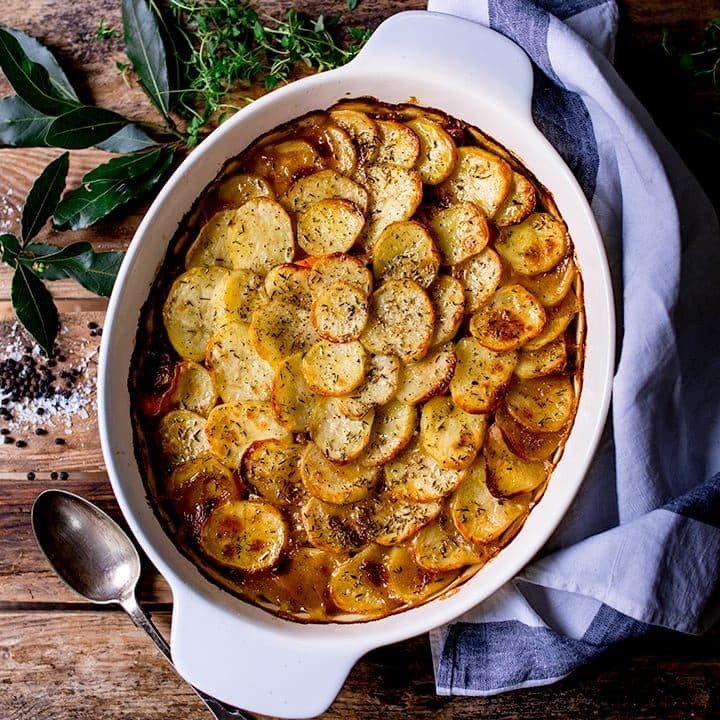 Dish up the shepherd’s pie and serve with green veg. Reheat the gravy in the pan just before serving and pour all over the shepherd’s pie. I never could resist mashed potato. My favourite bit of a roast dinner when I was younger, I always used to request lots of mash and gravy and a little bit of everything else! 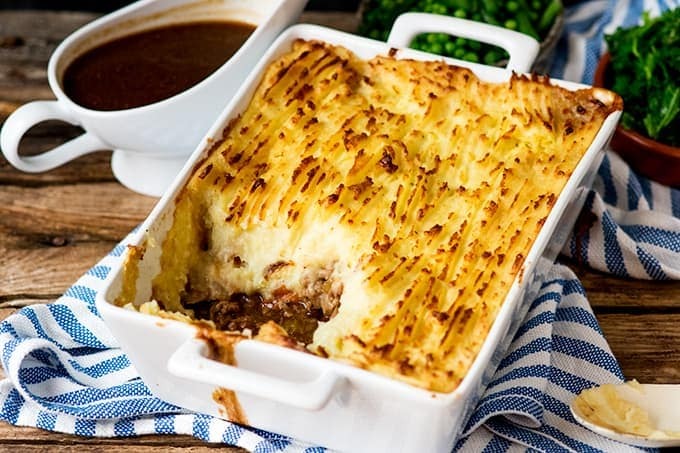 So by default, Shepherds pie and cottage pie are two of my favourite comfort foods. My recipe ensures you get plenty of extra gravy to pour over the top and I’ve even sneaked a couple of veggies in there too. Personally I love mine with lots of green veg and plenty of gravy. Chris likes it like that too, but his favourite way of eating it is to save some for the next day, then fry it up and serve it on bread with ketchup. Ok, I had a bite and it’s not terrible, it’s actually delicious, but so so wrong. 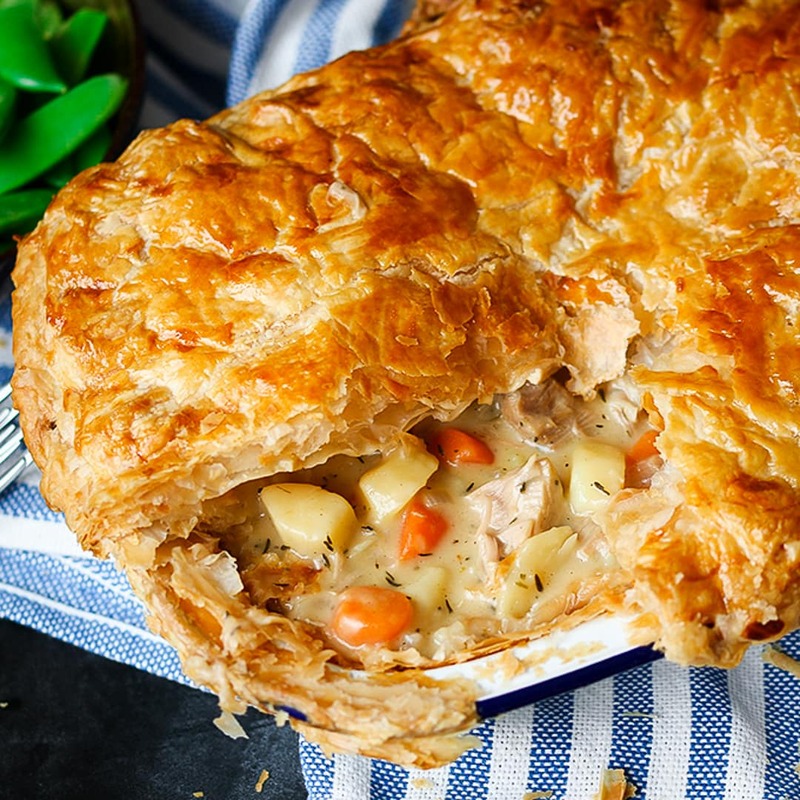 Are you serving up anything special for National Pie Week? I’d love to know! 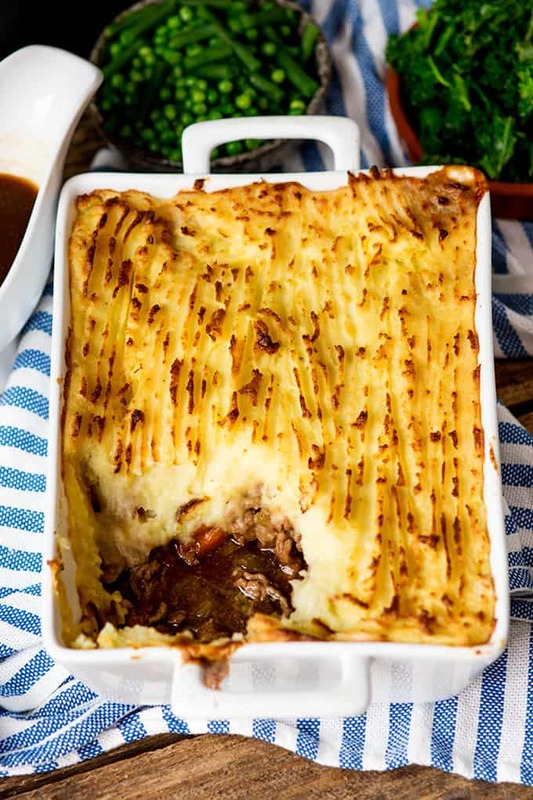 Shepherd’s pie is made with lamb mince, whereas cottage pie is made with beef mince. I tend to make and serve both with the same sides and I tend to make both in the same way. Yes! Use gluten free stock. Also check your Worcestershire sauce brand is gluten free – then you’re good to go. Yes, make the shepherd’s pie right up to the point before you put it in the oven. Then quickly cool, cover and refrigerate, along with the gravy. It should be fine in the fridge for up to a day. As above make the shepherd’s pie right up to the point before you put it in the oven. Then quickly cool, cover and freeze, along with the gravy. Can I make a vegetarian/vegan version? Can I double/triple it to serve to a crowd? Yes, this works great as a big batch recipe, and doesn’t need any adjustment to ratios of ingredients to make it work. You just need a bigger dish (or multiple dishes). Add a teaspoon of mint sauce to the gravy for a hint of mint that goes really well with the lamb. Add a layer of sauteed sliced leeks in between the minced lamb and potato layer. Use sweet potato instead of regular potato and add half a tablespoon of curry powder to the mashed potato for a slightly spicier version. You can also add 1/2 tbsp curry powder, ½ tsp ground coriander, 1 tsp ground cumin and a pinch of chilli flakes when frying the mince if you want to really spice it up. 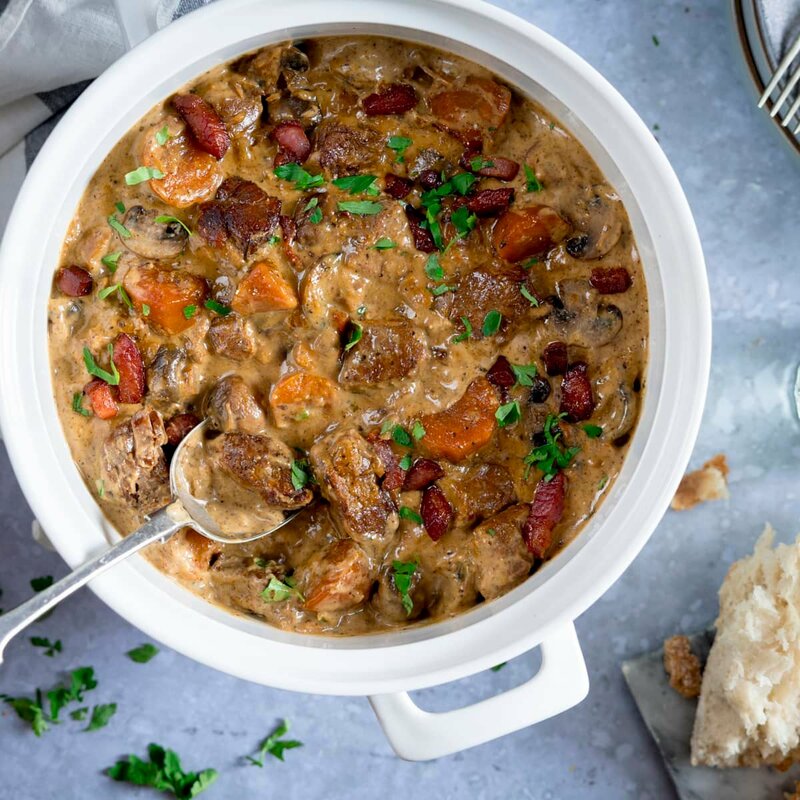 Comfort food alert! This is my Shepherds pie with creamy mashed potato and rich gravy - just like your mum used to make! Add the minced lamb and cook until browned – breaking up any pieces as you go. Add in half the salt and pepper, the Worcestershire sauce and stock. Simmer for 5 minutes. 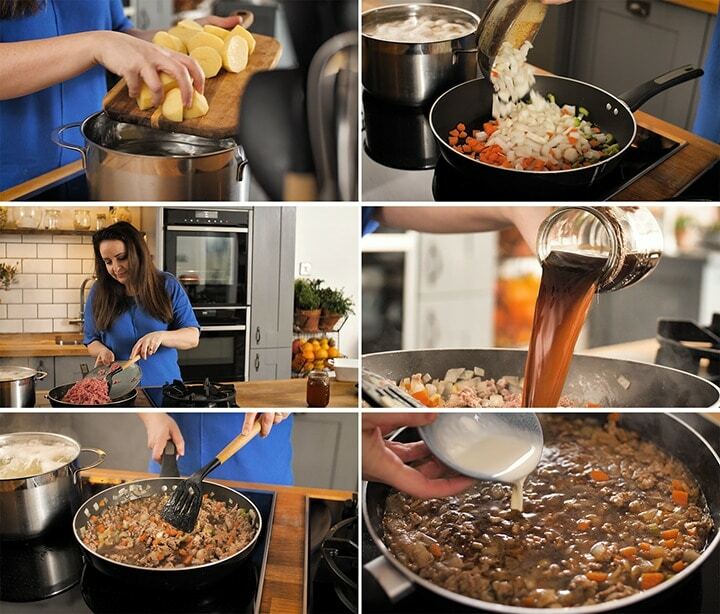 Mix the cornflour with two tbsp of cold water and stir into the simmering lamb mixture to thicken the sauce (you may need to add a little more if you like it thicker). Turn off the heat and use a slotted spoon to scoop out the lamb mixture and place into a 7”x 9” (18cmx23cm) baking dish. This should leave most of the gravy behind in the pan. Top the lamb with the mash potatoes, and flatten out with a spoon. Rough up the top of the mash with a fork (so you get nice crispy bits). Place in the oven for 20 minutes until the mashed potato is golden brown. Heat up the gravy, then serve the shepherd’s pie with the gravy and some green veg. 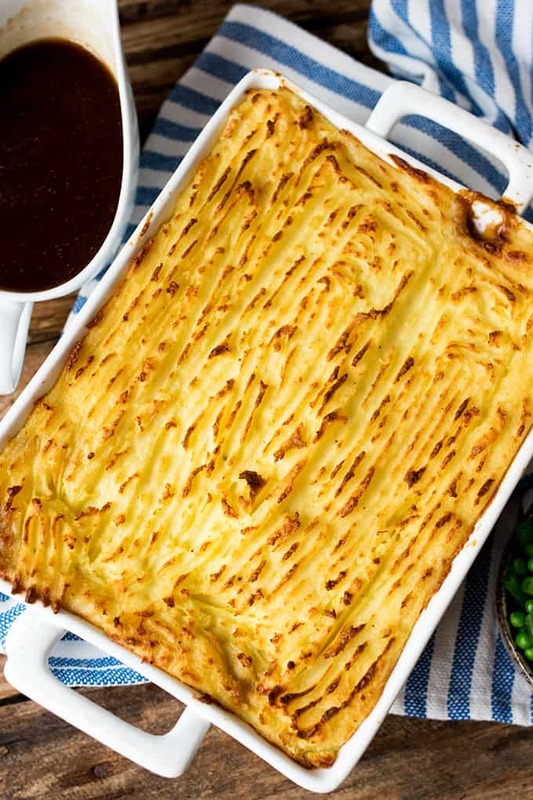 What's the difference between Shepherd's pie and cottage pie? 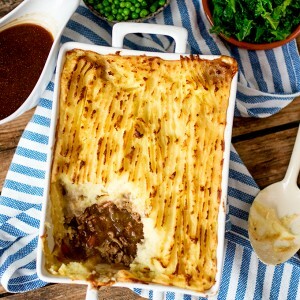 Shepherd's pie is made with lamb mince, whereas cottage pie is made with beef mince. I tend to make and serve both with the same sides and I tend to make both in the same way. Yes! Use gluten free stock. Also check your Worcestershire sauce brand is gluten free - then you're good to go. Yes, make the shepherd's pie right up to the point before you put it in the oven. Then quickly cool, cover and refrigerate, along with the gravy. It should be fine in the fridge for up to a day. As above make the shepherd's pie right up to the point before you put it in the oven. Then quickly cool, cover and freeze, along with the gravy. Yes, this works great as a big batch recipe, and doesn't need any adjustment to ratios of ingredients to make it work. You just need a bigger dish (or multiple dishes). Nutritional information is per serving, including gravy. This post was first published in March 2016. Updated in January 2019 with step-by-step photos, recipe video and recipe tips. Last minute planning after a long day in work followed by a workout at the gym, to be asked to put something together quickly and on the spot, your site allowed me to whip this dish together in no time at all, delicious, homely and simple to follow and it looked amazing. Thank you. Can your shepherds pie be frozen? As above make the Shepherds pie right up to the point before you put it in the oven. Then quickly cool, cover and freeze, along with the gravy. Most annoying recipe site I’ve been on. Your ads are very distracting! Won’t visit again. Sorry. Sorry you feel that way. 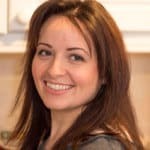 The ads are how we earn an income from the site, which allows us to pay the high costs of running the site and buy the equipment and ingredients needed to post recipes that are free for our readers to access. We do regularly review the number of ads and feel they are similar or lower in quantity compared to a lot of other websites. This is one of my all time favourite comfort foods. Takes me straight back to my childhood. Love it. I made this recipe tonight and it was a really big hit. The fact that it’s gluten free is a real plus for my family. And let me finish by saying that it disappeared quickly.